Tor Books announced the news today that author Gene Wolfe has died at the age of 87. I interviewed Wolfe in 1993 when I was a reporter for Pioneer Press Newspapers in Chicago’s suburbs, visiting him at his home in Barrington. Here is my article, which was originally published in the Barrington Courier-Review on March 18, 1993. The basement of the small Barrington house is overstuffed with books. Science-fiction novels line the walls, while hardcover reference books are piled on a desk, alongside stacks of paper. 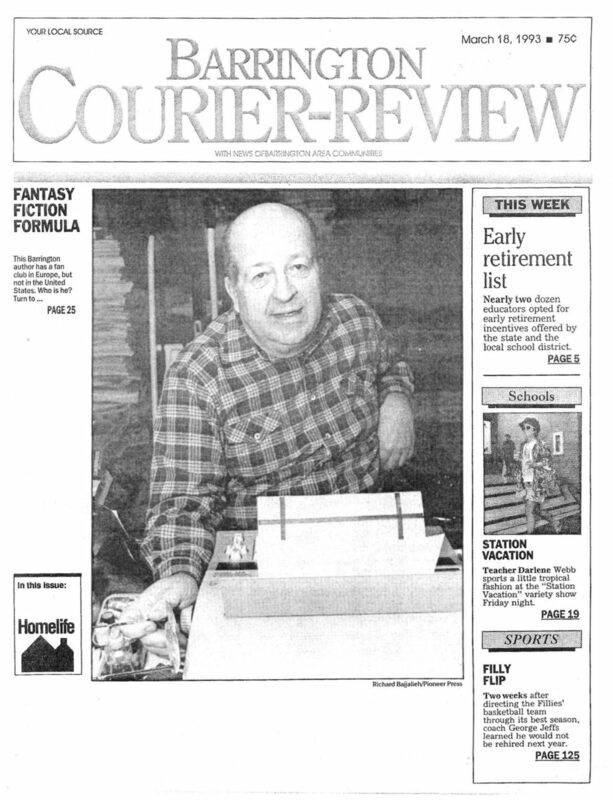 Gene Wolfe, an unassuming man in a plaid shirt, sits at the desk, using a typewriter. Two globes hang from the ceiling over Wolfe’s head. One is a standard globe of the planet earth; the other shows the constellations as they appear from the viewpoint of someone standing on the earth. But Wolfe’s mind wanders farther afield as he sits at the typewriter, imagining what the universe looks like from vantage points on distant planets and huge spaceships traveling through the emptiness of space. Wolfe shares his writing space with an exercise bicycle, an aquarium, a washing machine and a drying machine. “It’s a combination office and laundry room, and exercise area,” Wolfe jokes. When he takes a break from writing, sometimes he places a game of chess with a computer. A tally of victories taped next to the chess board shows Wolfe has won more games than the computer. Most Barrington residents don’t know it, but their town is home for the man recently described by the Washington Post as one of America’s best unsung writers. Those are high words of praise, but Wolfe has grown accustomed to high praise over the last 10 years. 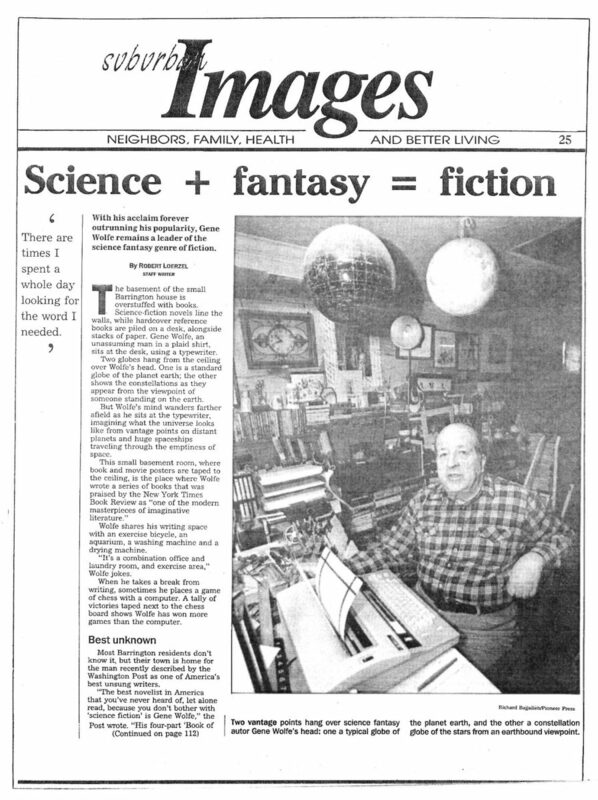 Wolfe’s books aren’t best-sellers, and he isn’t even one of the best-known writers in science-fiction circles. Yet his books have attracted a small but loyal cult following. Wolfe began writing fiction when he was in college in the 1950s, but it didn’t become his full-time occupation until about 10 years ago. While he wrote short stories and novels before work in the morning and after work in the evening, he spent 17 years as a mechanical engineer for Proctor and Gamble and 11 years as the editor of a Barrington-based trade publication, Plant Engineering. Perhaps the most important inspiration or Wolfe’s career came one day when he was sitting on a panel at a science-fiction convention, discussing sci-fi costumes. “I sat there listening and sulking, because no one had ever dressed as one of my characters,” Wolfe remembers. So Wolfe came up with a character that would make a good costume for the masquerading fans at SF conventions: a bare-chested torturer, wearing black boots, black pants, a black mask and a black cape. “Then I thought, ‘Who is this guy behind the mask? How did he get to be a torturer? '” Wolfe says. At first, Wolfe planned to write a novella about the torturer. But pretty soon, it was long enough for novel. Wolfe says he discovered he couldn’t finish the story in one book. The story about the torturer and his travels is set so far in the future that present history is forgotten, and technology seems like magic. As in other Wolfe novels, the science-fiction premise behind the story isn’t obvious at first. The story appears mote like a medieval fantasy than a futuristic tale. But gradually, the reader learns more about the structure of Wolfe’s fictional universe. “The Book or the New Sun” was written in archaic-sounding language, sprinkled with strange and obsolete words: preceptress, pancreator, fusUs, jezails and falchions, for example. Other science-fiction writers make up new words and names for the creatures and people they dream up, Wolfe says. But fictional animals are usually inspired by real animals, he says. “In science fiction, you call a rabbit a smeep,” Wolfe says, quoting another science-fiction writer. In other words, if you imagine a creature similar to a rabbit on another planet, you make up a nonsense name to describe it. “I said, ‘Why call a rabbit a smeep?’ There are plenty of other words for a rabbit,” Wolfe says. Wolfe’s approach is to find real words to describe the pieces of his fictional worlds. When he was writing “The Book of the New Sun,” Wolfe began digging through the Oxford English dictionary and other books tor the perfect words. Wolfe says he doesn’t expect readers to understand everything that Is going on in his novels right away. But he hopes they understand it alI by the time they reach the last page. Over the past few years, Wolfe has written several books that faIl outside the science-fiction genre, including the mystery novel “Pandora by Holly Hollender,” which is set in Barton, Ill., a fictional town patterned after Barrington. Wolfe says the Barrington Area Library’s Head Librarian Barbara Sugden recognized herself as a character in the book. But now Wolfe is hard at work on a new four-book science-fiction series. “The Book of the Long Sun” is a follow-up to the “Book of the New Sun” series, and the first book, “Nightside the Long Sun,” will arrive in book stores next month. The new series is set inside a massive generational spaceship, but the inhabitants don’t know they are in a ship. The “gods” of this spaceship, which is built from a hollowed-cut asteroid, are faces that appear on video monitors. The “long sun” of this world Is a plasma-discharge tube in the middle of the ship, Wolfe says. But most of these details are only hinted at in the first novel, which recounts two days in the life of a priest, who tries to save his church and parochial school from the clutches or a wealthy buyer. Wolfe’s loyal readers won’t find out until later who built the spacecraft, where it is going and why. Although Wolfe’s books continue to garner good reviews, including comparisons to literary heavyweights like Vladimir Nabokov, Wolfe says he never sets out to write award-winning books. “I don’t think people who write books sit down and say, ‘I’m going to write a book that’s going to win the Nobel Prize,’ ” he says. Wolfe remains modest when he’s asked about the high praise he has received from critics and his fans. “I’m always surprised and pleased when that happens,” he says. Read my story for Pioneer Press. Pioneer Press, February 16, 2016 — The Waco Brothers used to make studio records at a fairly brisk pace — releasing seven albums from 1995 to 2005 with their rousing mix of punk guitar riffs and country twang. “We thought it was a really solid string of records,” recalls Jon Langford, a singer-guitarist in the Chicago-based band. … Read more at Pioneer Press. Pioneer Press, October 19, 2015 — At the height of the grunge era, the Pennsylvania rock band Live’s second album, “Throwing Copper,” was on the Billboard charts for a year before it finally reached No. 1 — an unusually slow climb. Read the interview. Pioneer Press, August 20, 2015 — There was a time when you could walk into airports without worrying about metal detectors. You could greet friends — or even celebrities — as they exited airplanes, coming down stairs right onto the tarmac. “It breaks my heart that that era has vanished forever,” says Christopher Lynch, who grew up near Chicago’s Midway Airport… Read the story. Pioneer Press, June 19, 2015 — Soul singer Sharon Jones sounded and looked as vibrant as ever when she returned to concert stages in 2014, less than a year after learning she had cancer. She’d had six months of chemotherapy. Told by her doctors that she’d beaten the bile duct cancer, she wasted no time getting back on the road with her killer band, the Dap-Kings — not even waiting for her hair to grow back. Read the interview. Pioneer Press, April 30, 2015 — Austin, Texas, is famous for its South by Southwest festival. Now, the Edison Park neighborhood on Chicago’s Far Northwest Side is hosting a weekend of concerts with its own take on the moniker: the North by Northwest Highway Music Fest. Read more in Pioneer Press. This article by Robert Loerzel originally appeared in Pioneer Press on September 29, 2011. See Underground for longer transcript of my interview with Sally Timms. Which rock band would open a concert with short slideshow lectures, talking about obscure topics like “various breeds of pigs, real and imagined”? Which rock band begins the recording process by looking through a pile of history books? Which group includes musicians spread out across two continents, including two in Chicago and others in England? Who’s been together 34 years, with 26 albums but not a single hit? Who is “better than the Beatles,” according to the late legendary rock critic Lester Bangs? The answer to all these riddles is the Mekons, who started out as a punk band in Leeds, England, then evolved into a honest-to-goodness collective of musicians playing their own singular blend of country, folk, punk and rock. The Mekons have just released their first album in four years, “Ancient and Modern: 1911-2011,” and they’re playing an acoustic concert Tuesday (Oct. 4) at Evanston S.P.A.C.E. — the show will indeed feature an opening set of slideshow talks by the various Mekons. The following night, the Mekons play an electric show at Lincoln Hall in Chicago. In addition to a whole lot of wistful melodies that stick in your head, as well as a charging anthemic rocker, “Space in Your Face,” the new album is filled with fascinating lyrics that look back at what the world was like in the years just before World War I.
Timms says Mekons songs emerge out of discussions on these sorts of topics. For “Ancient and Modern,” the recording and writing began in a rented house near Greenhalgh’s home in the English countryside. While Timms sings lead vocals of three of the new songs, she says listeners shouldn’t assume she had more of a hand in writing those tunes. Each song is a collaboration by the whole band, she says. 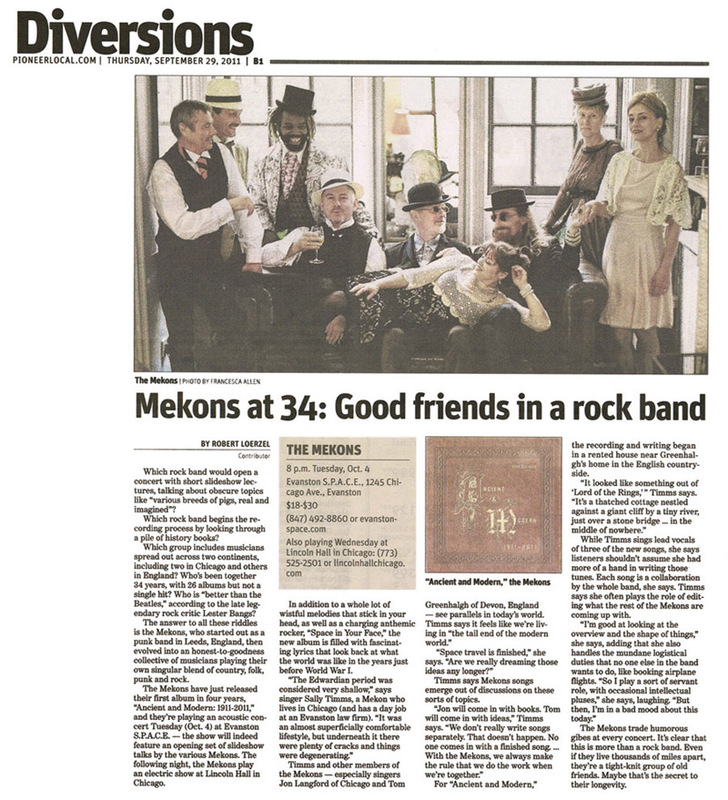 Timms says she often plays the role of editing what the rest of the Mekons are coming up with. The Mekons trade humorous gibes at every concert. It’s clear that this is more than a rock band. Even if they live thousands of miles apart, they’re a tight-knit group of old friends. Maybe that’s the secret to their longevity. This article by Robert Loerzel was originally published in Pioneer Press and the Chicago Sun-Times on September 1, 2011. In case you doubted Richard Thompson’s impressive credentials as a singer, songwriter and guitarist, he now has an official stamp of approval — from England’s Queen Elizabeth. The British musician … received the Order of the British Empire in a June 28 ceremony at Buckingham Palace. Thompson spoke with us in a phone interview. Q: What was the OBE ceremony like? A: You get to dress up like a 19th-century British prime minister — a top hat and tails. You get your 15 seconds with the queen. She said, “Oh, you’re a musician. That must be marvelous for you.” It’s a great honor. Q: So this doesn’t make you “Sir Richard”? A: No, that’s up another three levels or something. Q: Of course, you’ve had had other awards — and Grammy nominations. A: I’ve been nominated two or three times, but I haven’t won yet. I’m in the wrong category. I knew I should’ve stuck to polka. Q: Richard Thompson music is almost a genre unto itself. A: Exactly. There should be a category just for me, so I can win every year. Q: Why did you record your most recent album, “Dream Attic,” live? A: A lot of the feedback I get from the audience is that they prefer the live performance to the recorded performance. So I thought, ‘Well, what if we just cut out the middle process here?’ It’s quite a hard thing to do. The band has to rehearse and learn 80 minutes, flawlessly — or well, a few flaws, just to show we’re human. Q: Your current tour is solo. How is that different? A: You can create more stillness in the room. You can pull the audience in towards the music more. And you can put across lyrics better. Q: You’ve written 400 songs? A: I think so. Compared to some people, that’s good. Compared to Cole Porter, who wrote 2,000, that’s a bit lazy. Q: What are the differences between how you play acoustic and electric? A: If I’m playing solo, then I’m trying to be as orchestral as possible. What I’m trying to do is to render a band performance from a record in a solo format. I’ve never been happy with just going, “strum strum strum.” I’ve always thought the acoustic guitar should hold more possibilities than that. Q: Is it possible to put in words how you create a guitar solo? A: Uh. How many hours do you have? Q: We’ve got about three minutes. A: That’s tough. That’s a very large question. A small, quick answer would be: You practice shorter phrases. And then when it comes to soloing, you’re putting those bits and pieces together. And you’re inventing links between them. And then if you’re inspired, you’re also playing new things that you haven’t played before. You have the basic vocabulary that you learn through practice. And then when it comes to the actual solo, you’re applying some of those — you could almost call them clichés, but they’re your own clichés. What you’re trying to do is pile these clichés on top of each other in a new and interesting and meaningful way. Q: Are those the special moments for you, when you realize you’re playing something new? This article by Robert Loerzel originally appeared in Pioneer Press on August 11, 2011. “We’re kindred spirits,” James says. But until now, these neighbors have never worked together. Their first collaboration is a stunning and stirring film about “The Interrupters” — former gang members who try to talk current gang members out of committing acts of violent revenge on Chicago’s streets. After months of buzz and ovations at film festivals, the documentary opens Friday, Aug. 12, at the Gene Siskel Film Center. “The Interrupters” should accomplish those goals, but it doesn’t do it with voice-over narration or any direct message. 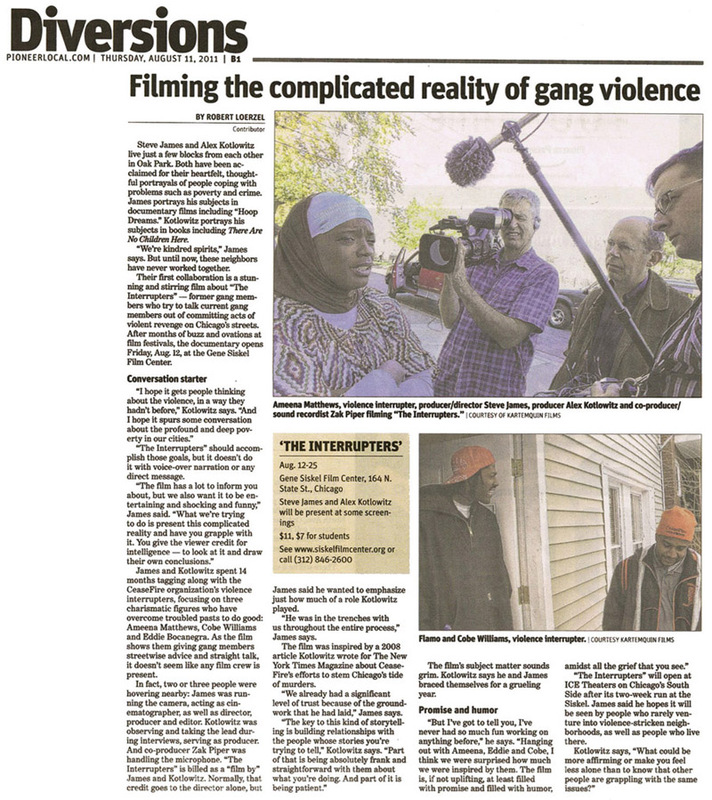 James and Kotlowitz spent 14 months tagging along with the CeaseFire organization’s violence interrupters, focusing on three charismatic figures who have overcome troubled pasts to do good: Ameena Matthews, Cobe Williams and Eddie Bocanegra. As the film shows them giving gang members streetwise advice and straight talk, it doesn’t seem like any film crew is present. In fact, two or three people were hovering nearby: James was running the camera, acting as cinematographer, as well as director, producer and editor. Kotlowitz was observing and taking the lead during interviews, serving as producer. And co-producer Zak Piper was handling the microphone. “The Interrupters” is billed as a “film by” James and Kotlowitz. Normally, that credit goes to the director alone, but James said he wanted to emphasis just how much of a role Kotlowitz played. “He was in the trenches with us throughout the entire process,” James says. The film was inspired by a 2008 article Kotlowitz wrote for The New York Times Magazine about CeaseFire’s efforts to stem Chicago’s tide of murders. “We already had a significant level of trust because of the groundwork that he had laid,” James says. The film’s subject matter sounds grim. Kotlowitz says he and James braced themselves for a grueling year. “The Interrupters” will open at ICE Theaters on Chicago’s South Side after its two-week run at the Siskel. James said he hopes it will be seen by people who rarely venture into violence-stricken neighborhoods, as well as people who live there.